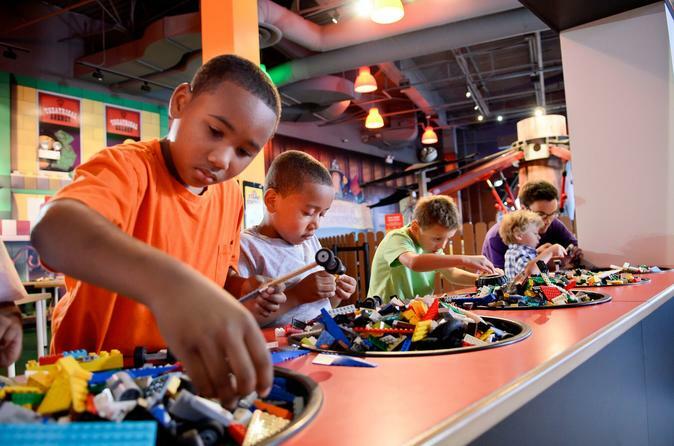 Let your imagination run free on a trip to LEGOLAND® Discovery Center Dallas. Fifteen fun-packed attractions will keep you entertained as you build, explore and marvel at the world of LEGO. Try your hand at engineering a LEGO building that will withstand an earthquake. Or create a brick in a LEGO factory, then immerse yourself in a 4D cinema experience! Kids of all ages will get wrapped up in the fun at LEGOLAND Dallas. Your admission ticket to LEGOLAND Dallas will give you tons to explore on your day out. See local landmarks recreated in miniature with more than one-million LEGO bricks at Miniland! How many will you recognize? You could make a game of it yourself. Brave kiddos (and adults) enjoy rides like Merlin’s Apprentice Ride, LEGO CITY: Forest Ranger Pursuit, and Kingdom Quest Laser Ride. Tots will lose track of time in the DUPLO Village where they can build forts and small houses from large squishy bricks. Watch the kids take action in a fire station jungle gym where they can climb, slide and run around as they live the life of a fire fighter. Then see if you can create a LEGO tower can withstand tremors at the Earthquake Tables. When your feet are ready for a rest, sit back in the 4D theater and watch the LEGO Legends of Chima characters try to win the land of CHI. The movie’s rain, wind and snow may even feel real during the 4D experience. If you need to refuel, a cafe offers snacks and light meals (own expense). If you’re looking for the latest LEGO sets or other LEGO toys, you’ll find a variety of items at the shop. Your day at LEGOLAND is sure to be a memorable event for the whole family! Please note: As a children's attraction and to promote a safe and family-friendly environment, adults cannot enter without being accompanied by a child. Special Offer - Price displayed includes a 11% discount off the local admission price! - Book Now!